I've been meaning for numerous months to find my friends a starter teapot. Only one of these is giftworthy. Can you guess just by looking at the lineup? The leaf pot on the left is awkward since you have to secure the lid while pouring and is bit of a dribbler. I'll probably put it to use as a madeira decanter. The cauldron shaped pot on the right is a new fangled kind of gaiwan, but it has glass filter inside with cut slits. It's pretty but the cut glass slits make me nervous. It's unlikely glass shards would splinter off the edge but I just feel paranoid. I'll probably use the bottom as a chawan. 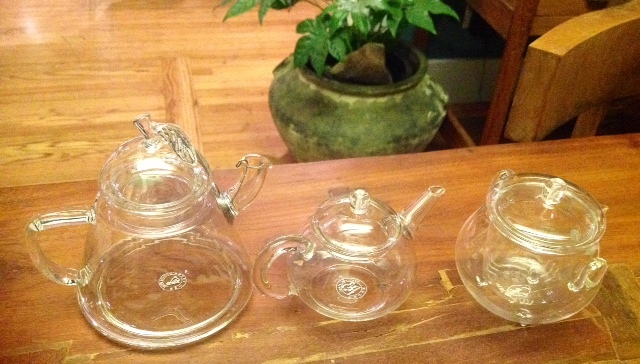 The pot in the middle is the training bra of glass teapots- it's perfectly serviceable and is a great way to get started with delicate pots. If you successfully manage not to crack it in the first few weeks, you can move up to something fancier. If you only have one teapot to start, I find glass is a good way to go because you can see exactly what's happening inside. You can brew almost any kind of tea although it doesn't retain heat well and does not impart anything so puerhs won't perform their best in the way they can with yixing. Nonetheless I've had many a good sheng session with glass. I have yet another 4th candidate from Red Lantern which is yet to arrive which hopefully will be my official gift teapot. Careful with that glass slit type filter as I had a glass mug that had that, and one day I noticed it was missing a small shard from the filter. The bad thing is I never found the missing piece. Probably drank it and did not notice. So I would not recommend those to anyone. Egads Emmett! I'm glad you are alive and did not become the Ice Queen. It's a Korean fear having glass shards go into the bloodstream. I often wondered what happened to those zombified Haitians that eat glass when they wake up the next day.